It was the kind of invitation sommelier Katie Stillwell had only dreamed about: a dinner party at the Sonoma mansion of famed wine collector Paul Rafferty to celebrate a rare bottle. Everyone enjoys drinking the $19,000 wine, but Katie realizes it's not the vintage listed on the label. When she confides in Mr. Rafferty, he asks her to investigate, and she soon discovers the deception goes beyond money--it includes an accidental death that might just be murder. 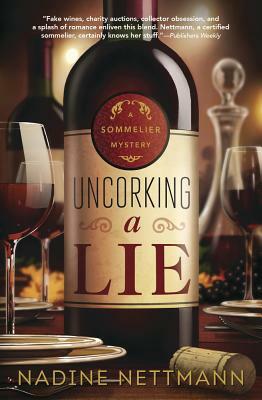 As Katie falls deeper into the world of counterfeit wine, she learns everything is at stake . . . even her life. Nadine Nettmann, a Certified Sommelier through the Court of Master Sommeliers, is always on the lookout for great wines and the stories behind them. She has visited wine regions around the world including Chile, South Africa, Spain, Germany and every region in France. Nadine is a member of Mystery Writers of America, Sisters in Crime, and International Thriller Writers. She lives in California with her husband.